Kevin Smith '80, left, and his uncle, Raymond Smith '52, attended the Green Tie Dinner that celebrated the college's centennial in 2011. The SUNY College of Environmental Science and Forestry (ESF) has received a $2.4 million gift from the estate of an alumnus, the largest cash gift the 103-year-old college has ever received. The gift from the estate of Raymond M. and Rita J. Smith of Tonawanda, N.Y., will be used to fund student scholarships, primarily for students from Western New York. Raymond Smith was a member of the college's Class of 1952. "He felt that understanding of the environment and its conservation is very important to our quality of life, and that is a mission of ESF," said Raymond Smith's nephew, Kevin Smith of Syracuse, a member of ESF's Class of 1980. "Another key factor for Uncle Ray's generous gift was that he was very grateful to have been given the opportunity to attend college and he wanted to give other people with financial need that same opportunity." Raymond Smith, who died in September 2012, studied forestry at ESF. He spent his career with Davey Expert Tree Co., a national tree service company, where he was first employed at the age of 16. When he retired more than 40 years later, he had moved up to the position of regional vice president. "He helped build a business that became a national company," said Brenda Greenfield, executive director of the ESF College Foundation, Inc. When he made a gift to the college before his death, Raymond Smith described ESF as "a fantastic college, doing an absolutely wonderful job." His total gifts to the college over the years amount to $2.65 million. "This will have a huge impact on our students," Greenfield said. "With the funds that will be generated by his endowment in years to come, we could offer an additional 100 students $1,000 each in support. That's a significant percentage of our students." ESF enrolls approximately 1,750 undergraduates. Raymond Smith spent his childhood in Medina, N.Y., northeast of Buffalo. After graduating from Medina High School, he enlisted in the U.S. Army, was trained as a paratrooper and served during World War II. Kevin Smith said his uncle was one of five children, and that he was able to attend college because of his G.I. benefits. "Without this opportunity Uncle Ray felt that he would never have had the career that he had with Davey Tree," Kevin Smith said. Raymond Smith remained proud of his connection to ESF, as evidenced by the college ring he wore daily. "It was gold with an emerald-green stone with a gold conifer tree on it," said his nephew, who is now an engineer with Lockheed Martin. "My father gifted it to him upon his graduation." 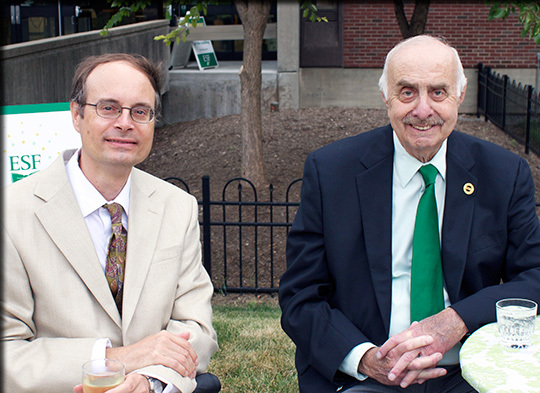 Raymond Smith remained active in ESF alumni affairs and attended the 2011 "Green Tie Dinner," celebrating the college's centennial, with his nephew in July 2011. Kevin Smith said his uncle was a "kind and gracious man" who looked for the best in people. That thought was echoed by Raymond Smith's grand-niece, Patricia Kanick of Buffalo, who described her uncle as caring, generous and down-to-earth. "He was a true gentleman," Kanick said. "It didn't matter who you were. He gave everybody a chance. He got along with everybody." When he and his wife, Rita, a third-grade teacher, hosted holiday gatherings for the extended family, the meal often included a pheasant that Raymond Smith had bagged on a hunting excursion. He was also an avid turkey hunter and fisherman, and a fan of Syracuse University football and basketball. In his retirement, he enjoyed golf, even traveling to Scotland to play at the famed St. Andrews Links, which calls itself "the home of golf." Raymond and Rita Smith were travelers who visited, among other places, Turkey, Greece, England, Scotland, Denmark, Germany, Poland, South Africa, China, South America, Alaska, the former Yugoslavia and Egypt. In addition, Raymond Smith's job involved travel around the United States. Raymond Smith was named New York State Distinguished Arborist in 1988. He died at the age of 84. His wife of 42 years died in 1996.